At the half way point of the championship the favourites are beginning to emerge. Donegal and Shannon Blues are on maximum points, while Kerry, Wolfe Tones and the Gaels are tied in third on five points each. Galway, Christopher’s, and McAnespies are in the lower half of the table, but along with Cork still look like there is a shot at the playoff spots. No team has an easy run in, and with Cork beating Wolfe Tones last Sunday nothing can be taken for granted this season. Should be an exciting July and August with every game counting for something and it starts next Sunday. 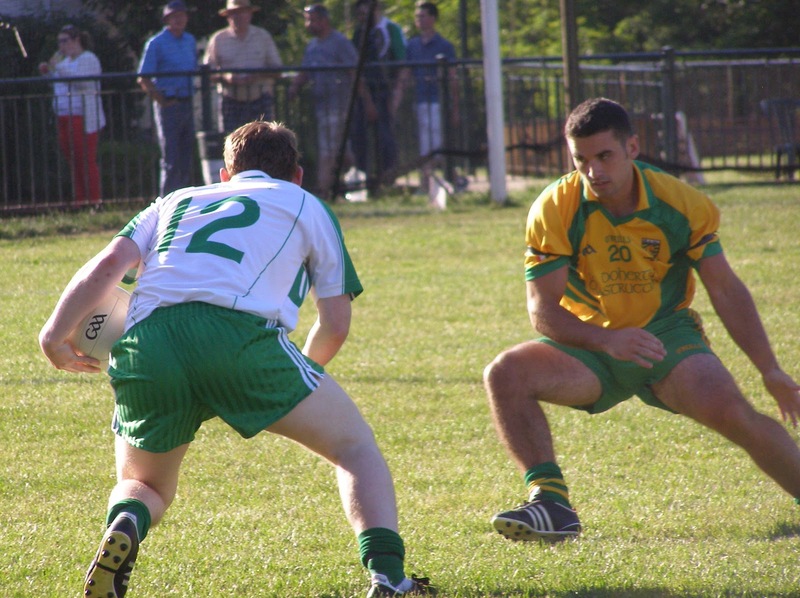 Kerry will be looking to get their playoff run back on track following their defeat to the Connemara Gaels. The Kingdom face Armagh-Notre Dame who have yet to win a game. Based on current form there is a great opportunity for Kerry. There are some good players scattered throughout the field. Kieran O’Connor at center back, Laoisman Ian Whelan in the middle, and Donnacha Fenton up front give Kerry a balanced look. Armagh-Notre Dame have had their struggles of late, but there is some have some talent on the roster also. Old hand Frank Meehan, Conor McGee, Alan O’Donovan, and Kevin Marrow are as capable as any out there, but a win for the Orchard men would have to be considered an upset. Galway and the Gaels will a huge showdown in the battle of the west. Each side will fancy their chances and I would venture to say, are evenly matched. The Gaels defence will have their work cut out against Galway’s quick forward line that contains Danny Reddin, Kevin O’Hara, and Graham Cullen. The Gaels might be a little bit stronger with the likes of Noel Graham, Daryl Hayden, and Graham Delaney in the half forward line, while Sean Conneely and Padraig Cunningham are playing very will at wing back. American Born Brian Joyce has also had some good outings this season for the Gaels, and based on form so far, I’d have to give the Gaels a slight edge. The last game of the day is a massive one for Wolfe Tones. An early season favourite, the Tones have had to juggle with injuries and player availability. With all the cards in the deck the Tones are a match for any team, and have shown some character at crunch time in games this year. The Southie lads suffered an unexpected defeat at the hands of Cork last week, a game that could define their season either way. Donegal have yet to be beaten, but present an opportunity for the Tones to take a big scalp. The Tones forward line is as good as any out there which contains players of intercounty pedigree such as Cormac Joyce-Power (Limerick) and Barry Grogan (Tipperary).. Midfield is the achilles heal, and Charlie McCarthy a former Meath county footballer, has been shoring up that area of the field. Donegal are led by their midfield of the two Brian’s, Brian White and Brian Donnelly – their strongest point is the Tones weakest. Donegal are also well balanced throughout the field, and word on the street of the arrival of Westmeath’s Dessie Dolan will make them very hard to beat. The headline game of the day was a real humdinger between Aidan McAnespies and Shannon Blues. It was a game of high intensity where no ball was easily won and no score easily converted. McAnespies worked very hard in the first half to keep the Blues at bay, but in the second the Blues, who lined out with Waterford’s Shane Ahern in the middle of the field, pulled ahead and went on to win an absorbing contest as the McAnespies players tired. Shannon Blues had a great win over Aidan McAnespies Sunday Afternoon. It was clear that McAnespies were up for the challenge right from the get go. The defence worked extremely hard when the Blues were in possession, to the point that it was very difficult for any of the Blues forwards to find the room to shoot. The Blues had plenty of possession and would have hoped for more then the two points that they had at the end of the half. At the other end of the field it was not plain sailing for McAnespies either, their hard efforts yielded five points. Two came from each of Colm McCrory and Colly Donnelly, and one from Kieran Traynor. The Blues managed two points in the opening period, Dave Dineen and Gary Curran, who entered as a sub, were the scorers. At the break it was a three point advantage for the Macs and clear that if they were to turn the Blues they would need to keep up the same intensity in the second half as in the first or three points would not be enough. Aidan McAnespies were unable to keep it up for the full 60 minutes against the Blues. The Blues kept up the pressure from the start of the second half and the breakthrough came about 10 minutes of the second half. Kieran Hurley finished a sweeping move that involved a lovely tip on from James Hynes, with a goal from point blank range and the score put the Blues one point ahead. Hurley and Donal Kingston, the big corner forward for Macs, had exchanged scores to open the second period and things started to open up for the Blues. Dave Dineen and James Hynes extended the lead to three points. Changes were made on the McAnespies side of the field. Kingston was moved to the middle of the field to see if the big Laoisman could turn the tide there. McAnespies won plenty of possession but the ball into the corner forwards was not getting any change from Conor Phelan or Ross Callaghan manning the Blues full back line. The Blues always looked dangerous in attack now and swept down the field as possession changed hands. The scores came easier. Hurley, Hynes, and Brian Curran all pointed down the stretch, and a goal would now be required from McAnespies to get a result. The goal never came, a half chance fell to Daniel McKenna but Tom Sayers was up to the task and saved. Great celebrations from the Blues supporters, while disappointment for McAnespies was tempered with hopes of better things to come. Donal Og Hodnett was on form for Cork on Sunday. Cork shocked the Wolfe Tones, and the Boston GAA world, with probably the biggest win for the club since the glory days of legendary players, Lar Barden, Richie Fleming, and Frank Delaney. The rebels streaked out into a 10 point first half lead, but the Tones clawed it back and almost pulled off an unbelievable comeback in a nailbiting finish. With the staunch Cork supporters in the crowd pleading for the referee to end the agony, Louthman James Califf* provided Cork with an insurance point as he carried his team through a stomach churning second half. Cork played some good football in the first half while the Wolfe Tones more or less slept through the first 30 minutes. 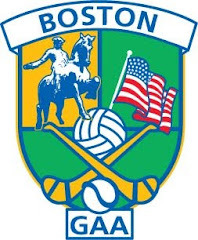 Early in the half the Tones must have been wondering if the GAA Gods were conspiring against them after Gary Connaughton, Westmeath’s keeper who came to Boston and enlisted with the Tones, twisted his ankle in making a fine save from Pat Leddy. Following on the injury to Tipperary man Brian Jones early in his first outing early this season it was a tough blow for the Southie lads. Ray McKeown retook his place in nets for the Tones, and Cork piled on the pressure in front of a somewhatbemused crowd, who were expecting a comfortable win for the Tones. Perhaps the Tones were too as they seemed caught in a vice of slumber. Cork played the ball well out of defence, and found Pat Leddy time and again. Leddy was the cog in Corks efforts and accounted for 1-4 of Cork’s first half total. Colm Caffrey pointed from wing back, and other scores came from James Califf, Donal Og Hodnett, and John Wycherley. Cork had size on their side and as they outmuscled the Tones, and as the half wore on the unlikely became a possibility. The Tones seemed to try and lift themselves in spurts, Barry Grogan accounted for three points and Marty Farrell one, but nothing sustained came from the blue shirts. At the half it was 1-11 to 0-4 in Cork’s favour. James Califf coming through for Cork. The Tones wasted no time in launching their comeback. After the first fifteen minutes the Tones had clocked up an additional five points and clawed back the deficit to five points. Cork’s effort had dropped to such an extent that it now looked a likelihood that the Tones would emerge victorious and Cork were undergoing a second half collapse. It was 18 minutes before Cork scored their first point of the second period through Califf. The Tones were winning the kickouts, and introduced Laois man, James Doyle. Doyle looked his usual sprightly self and caused some problems for the Cork backline. Mike Newmann, Marty Farrell, Doyle, Grogan, and Collie Carr all partook in the scoring feast, but then Cork got themselves back into it. Califf pointed twice from midfield before Mick Lynch was called upon to make a fine save from Barry Grogan – a goal at that stage would surely have led to Cork confidence waning severely. Burke again pointed, and it seemed as though Cork had affairs in hand, but the Tones began to attack in waves again as Cork easily turned over the ball time and again. With forwards of the caliber of the Tones, such mistakes will be penalized and they were. Grogan,Joyce-Power, Gary Brilly, and Marty Farrell brought the Tones within a point as injury time dragged on. It was justified however as there were at least three lengthy injuries in the second period. Califf scored Cork’s fourth point of the second half and with one more chance to try a score the Tones put the ball over the sideline, and the final whistle sounded to the joy of the Cork faithful. An upset to be sure, and not exactly what the Tones wanted going into next week’s game against Donegal. Cork: M. Lynch, O. Boyle, K. Moynagh, C. Caffrey, C. Moynagh, R. Hodnett, M. Burke, J. Califf, T. Clancy, P. Leddy, J. Wycherley, D. Og Hodnett, M. Moynihan. Tones: G. Connaughton, P. McGuirk, D. Dalton, G. Brilly, B. Kennihan, K. Regan, J. Farrell, C. lynch, C. Carr, M. Newman, M. Farrell, B. Grogan, C. Joyce-Power. *Report updated from initial posting. Senior Football: Gaels end Kerry's Unbeaten Streak. Connemara Gaels ended Kerry’s unbeaten streak with a convincing win on a blustery Saturday afternoon. The game was of huge importance for each club and the Gaels took control right from the throw in and looked good for the points throughout. Fine performances from wing backs Sean Conneely and Padraig Cunningham along with a dominant midfield proved to be the keys to the Gaels victory. The Gaels Michael Rogers and Kerry's Mike Godley. The stiff breeze favoured the Gaels in the first half and the westerners took full advantage. There were a handful of new faces lined out for the Gaels, but it was Padraig Cunningham who stood out. Sean Conneely had a fine first 30 minutes at wing back, working hard when the Kerry had the ball and the man from Ros na Muice was always willing to help out the attack. That said, the Gaels defence worked hard as a unit and on the rare occasion when Kerry were in attack closed down the spaces and blocked several attempts at scores. Midfielders, Joe Greaney and Sean Moran were very much on top and two early goals set the tone for the half. Conneely won the ball deep in the Gaels back line and it made it’s way to Cunningham and the Ballinasloe native slotted home from close range. Shortly afterwards Graham found the net and the Gaels played with a spring in their step. Points came from Daryl Hayden, Eric Monahan, Conneely, and Joe Greaney. Kerry’s had little to show for their efforts, Shane O’Neill at corner forward found himself with little room to operate, though the ball rarely found it’s way at his end of the field. Eric Monaghan shoots for the Gaels. Even with the advantage of the breeze for the second half, the twelve point difference looked like it would prove to be too high a mountain for Kerry, and got a little higher after the first two points of the second half went to the Gaels. Ciaran O’Donnell made his way from corner back to slot the first over, and Sean Moran the second. Kerry improved their showing in the second half, but the task for the Gaels at that point was to keep their noses in front. Shane O’Neill hit with a goal for Kerry, but the Gaels answered soon afterwards with their third of the game. Dylan Hayden played a lovely ball over the top to Monaghan who finished from close range to the delight of the Gaels support in the crowd. 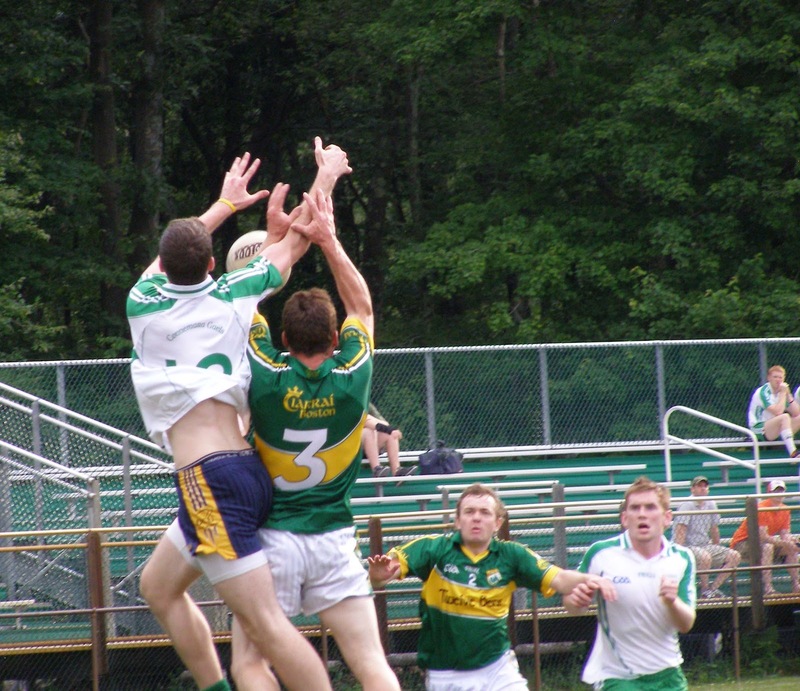 Kerry continued to put some pressure on the Gaels, but lacked the final touch. Ian Whelan, Mark Schute, and Kieran O’Connor pointed and a second goal came from Schutte to improve the look of the scoreboard. The Gaels emptied the bench to give a run to the subs. Satisfaction with the win for the Gaels, and Kerry brought down to earth following a great start to their campaign. Gaels: J. O’Donnell, D. Doolan, C. O’Donnell, S. Conneely, B. Joyce, P. Cunningham, J. Greaney, S. Moran, G. Delaney, D. Hayden, N. Graham, M. Rogers, E. Monahan. Kerry: S. O’Leary, M. Godley, J. O’Mahoney, L. Mulligan, K. O’Conner, J. Coffey, I. Whelan, I. Somers, M. Schutte, P. O’Neill,, D. Fenton, S. O’Neill, C. O’Brien. Mayo faced a strong opponent in Christopher’s, a team with several players of top class pedigree. Christopher’s had the game pretty much in the back by the time the first half had ended as the gulf between the teams was large. Mayo gave a much better account of themselves in the second half, at that stage it was all the westerners could do but play for a bit of pride. Christopher's had it relatively easy over Mayo Sunday afternoon. Christopher’s dominated proceedings in the opening period and proved to be just too strong for the Mayo lads. The Christopher’s defence swarmed over Mayo attacks and afforded little space for the Mayo forwards on the rare occasion that the ball found it’s way to that end of the field. Christopher’s set the tone early with a goal in the second minute from Chris Brady. Brady proved his worth with a slew of scores from his half forward berth in the first half. Also on the half forward line for Christopher’s was Daithi Casey who seemed well at ease, the Dr. Crokes man broke through the Mayo defence time and again. Gavin O’Grady in the corner also enjoyed a healthy dose of possession and netted towards the end of the half. Pat Delaney who lined out at corner forward added a third goal from close range as things opened up too easy from a Mayo viewpoint. Sean Clifford and Barry McShea did what they could at the back for Mayo, but it was a good as CuChulainn fighting back the waves. At the break Christopher’s led by a huge 3-9 to 0-2. Mayo made a better fist of it in the second half, but the game was already gone. Mayo may have had a glimmer of hope for better things to begin the second half after Danny McGowan put a fine point over the bar. They were soon dashed after O’Grady won a penalty and put it away himself. A fifth goal came soon afterwards and that was all she wrote as a contest. Each side brought in some subs, and Mayo hit with a double strike from Colm Clifford who netted thanks to some great work from Maurice Hickey. Right afterwards Dan McGowan finished superbly into the far corner of the net, and raised Mayo pride. Mayo enjoyed a better return from the exchanges now, and Christopher’s lost Mark McSweeney, who had just come on as a sub, to a red card. A lesson from the encounter is to remove ALL of your jewelry before togging out. Christopher’s were happy to see out the clock and sat back in their own half and played out the last 5 minutes by keeping possession. Christopher’s look like they will be in the mix again come playoff time, while Mayo will be looking for a chance of two points when they meet Cork in two weeks time. Christophers: J. Kenneally, D. O’Leary, C. Murphy, P. Kenneally, B. O’Regan, T. Clancy, S. Flanagan, D. Kenneally, D. Culhane, D. Casey, C. Brady, G. O’Grady, P. Delaney. Mayo: B. Cassidy, L. Monaghan, S. Clifford, T. Rooney, B. McShea, M. Hickey, B. Murphy, S. Kenny, D. McNicholas, D. McGowan, D. Igoe, P. Hickey, K. McAllister. Galway and Tipperary got their championships off to a start in a testy game Sunday afternoon in Canton. There was no shortage of talent on the field with both teams featuring players of top caliber hurling pedigree. Kevin O’Loughlin of Dublin and Kilmacud Crokes was a big factor for Tipp, while for Galway Kilkenny man Eoin Guinan made a return to the fold. Tipperary pulled away in the second half as Galway’s front five struggled to gain a foothold in opposing territory as the game wore on. John Roche looks to clear for Tipp. Galway held the slightest of advantages at the end of the first period after getting off to a great start with a goal from Eoin Guinan. Tipp worked their way back into the game, Kevin O’Loughlin at half forward and Michael Ryan proved to be accurate from dead balls and open play. Galway relied on Guinan for most of their scores, but also got contributions from Tom Bulger and Kevin Canty. Stephen Nolan was a major force at center back, a player with experience hurling for the Wexford county team, Nolan marshaled his forces well. The game got a little testy towards the end of the half with a few incidents leading to both sidelines pleading victimhood with the referee. At the break it was as tight as could be with Galway holding a 1-8 to 0-10 edge. try to get control of the ball. Tipp came out of the gates strong in the second half. Two goals in the first 15 minutes of the restart put Tipperary in the drivers seat. The first came from Michael Ryan who burst past the last defender and fired home from close range. The second was a thing of beauty with O’Loughlin showing his skills and flicking the dropping ball to the incoming Brian Hartnett. The Cork native took one touch before driving the ball home from the 14 yard line. Galway lost their teeth up front and the Tipp half back line were well on top at this point. Paul Haughey, O’Loughlin, and Ryan all contributed to the scoresheet for Tipp. Tom Bulger netted for Galway with two minutes to go to make it a seven point game. Things got out of hand at the end of the game as following a challenge on John Moylan, Stephen Brown and John Roche got into it and were both sent to the line. Tipp looking strong out of the gates, while Galway might need another forward or two. Galway: M. Mulrooney, M. Lennon, B. Watkins, C. Kelly, S. Nolan, D. Shaw, S. Corry, M. Brooks, J. Moylan, K. Canty, S. Brown, T. Bulger, E. Guinan. Tipp: S. Delaney, J. Kindregan, J. Roche, B. Cleary, A. Hannigan, J. Doughan, C. Dempsey, A. Callinan, M. Ryan, S. McGrath, P. Haughey, K. O’Loughlin, B. Hartnett. Donegal and the Gaels raised the curtain on Sunday afternoon, with Donegal very much the favoured side. Featuring four American Born players in the team, the Gaels made a game of it for three quarters but in the final 15 minutes Donegal found more space in which to operate and put paid to the Gaels challenge. tries to burst the tackle. Donegal looked the more dangerous side over the first 30 minutes, though the Gaels battled hard. On at least two occasions Donegal were through for a goal, however, Bosco O’Halloran did well to tip the ball over the bar for the first, and Rocky Ivers shot narrowly wide for the second. Donegal did clock up some points, Christy McLoughlin accounted for three in the first half, Niall McConnell two, and Kevin Curran the sixth. The Gaels back line worked hard to prevent Donegal from getting away from them and with Brian Joyce playing well in midfield and Joe Casey making forward runs, the forward line depended on Tom Sally McDonagh and Kevin Owens for scores. McDonagh delivered three times and Owens once and at the break it was 0-6 to 0-4 in favour of the northerners. Christy Bell in Full Flight. Donegal converted a major to begin the second period. Darren Green finished a move in which Christy Bell and Rocky Ivers combined to open up the Gaels back line. The Clonmany man made no mistake from 14 yards. Donegal enjoyed most of the possession but missed some good scoring chances, and Gaels managed to keep themselves in the game for the first 15 minutes of the second period. Casey, Conor Lohan, and Owens wiped out the goal with three points on the trot, but as the half wore on Donegal got stronger and Gaels faded. Niall McConnell and Christy Bell put three points over the bar between them, and Bell then delivered the hammer blow with a goal of his own creation. Bell beat his defender and buried the ball from close range. After McConnell and Green added to the ever extending Donegal lead, substitute Barney Friel netted the third for Donegal. A convincing win for the Tir Chonaill men and the Gaels still looking for a point in the junior A championship. Armagh-Notre Dame gave it a go but did not have enough juice for Galway. Armagh-Notre Dame held their own in the first half, but one had the feeling that the chances of an upset were slim. Galway missed a plethora of scoring chances that would have seen their half-time lead be far more than the single point that it was. A sending off early in the game also gave the feeling that it would probably hurt the Orange half of Brighton more than it would Galway. Corner back, Shane Murney, and Galway’s Keith O’Hara were shown the line for their part in an off the ball wrestling match eight minutes into the game. Armagh-ND kept in it for most of the half thanks to a goal from Conor McGoran who fisted a bouncing ball into the net from the edge of the small square. Galway had put three points over the bar, one each from Mark Kenny, Eoghan Whelan, and Ollie Doherty. Jamie Keogh leveled the scores and Galway then opened up a lead. Leon Kelly and two Doherty frees looked like they would put Galway three to the good at the break, but a late flurry from the northerners reduced the deficit to the one point. Conor McGoran and Shane Marrow each pointed before the break. There could also have been a goal, but Pronsias McComiskey got down well to save from McGoran. The Galway footballers got the better of their Brighton rivals, but only just. Armagh-Notre Dame threw the cat among the pigeons with a second half goal that put them into an unlikely one point lead. Galway had missed some easy chances to start the second period, and at that point the unlikely upset looked possible. The game slipped away from Armagh-Notre Dame from that point on however. Galway stepped up their level of intensity and the orchard county side began to tire. After Doherty leveled the scores, Kenny and Graham Cullen went to work and combined well to put four points over the bar between them, and put some distance between the teams. The frustration grew for the northerners as Galway played the ball around with relative ease in the final quarter. Doherty added two free kicks to round out the scoring. Armagh-Notre Dame yet to record their first win, and Galway take their first two points of the season. 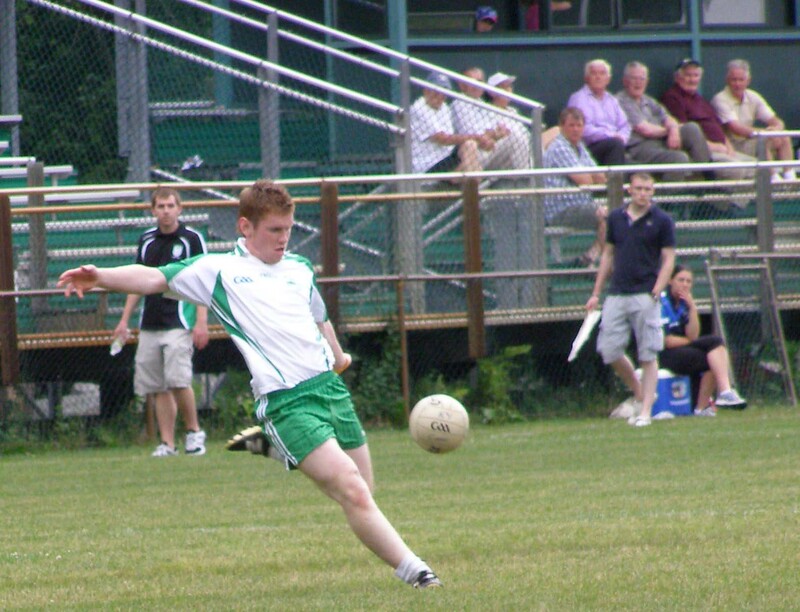 It was a tremendously exciting 60 minutes with Wolfe Tones looking for a win over Christopher’s to get back on track in their quest for the 2012 senior football championship title. The Blue team from Southie got the two points but not without some concern as Christopher’s had a one goal lead heading into the final quarter of the game. The Tones lifted themselves in the latter stages and showed signs of being worthy of the early season tag of favourites. 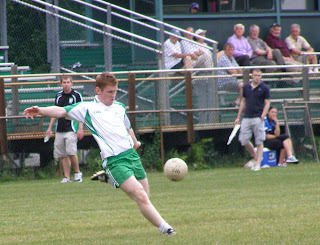 Gavin O' Grady on the attack for Christopher's. The Tones looked very good when in possession and passed the ball around well. Plenty of running in the forward line opened up the Christopher’s rearguard on several occasions, though Noel Ryan and Chris Murphy stuck to their task well at corner back for Christopher’s. Marty Farrell was on the mark and popped over three points, while Gary Brilly, Barry Grogan and Charles McCarthy also got on the scoreboard. Christopher’s looked dangerous when going forward however, and when the ball got into the hands of Daithi Casey at center forward the possibilities opened up for the Hyde Park side. The Wolfe Tones rearguard proved to be a tough barrier to overcome however, and broke up several attacks. Pauric McGuirk is about as solid a corner back as you will see and Davy Dalton in the opposite corner caused plenty of problems for his man, Gavin O’Grady. One such turnover caused by Dalton resulted in the Tones sweeping upfield and putting the ball between the sticks. Christopher’s kept in touch through points from Paddy Manning, O’Grady, Eoin Gorman and Casey. At the break it was three to the good in favour of the Tones, 0-7 to 0-4. Gary Brilly gets the pass away for the Tones. After the Tones added to their lead by two points after the restart, Christopher’s went on a scoring streak thanks for some impressive play in the half back line by Paudie Kenneally, as well as Shane Flanagen and Pat Delaney in the middle of the field. O’Grady pointed twice, and Chris Brady once before Paudie Kenneally put a wonderful point over the bar from distance. After Shane Flanagan and Brady brought the teams on level terms, it was O’Grady who fired Christopher’s into a one goal lead with a well taken goal following a great move upfield. Thirteen minutes to go and how would the Tones react? Michael Newman pointed twice and Farrell once to bring the teams level once again as the Tones lifted their game in response to the setback. Christopher’s introduced Danny Kenneally for the last 10 minutes but in a twist the Tones netted within seconds of the big man’s introduction. With an awkward ball bobbling around the corner of the small square, Barry Grogan fisted the ball into the far corner of the net over the head of the advancing Jerry Kenneally who will look back and wish he stayed on his line. The Tones now had the initiative once more and the midfield ball fell into the hands of the blue shirts. Farrell added another point to make it a two score game. Christopher’s needed a goal and had to settle for a point from David Aherne as the Tones defended in depth. Brilly added the insurance point in the dying minutes as the Tones tally another 2 points. The Gaels were up against it on Sunday,facing the table topping Donegal. The westerners almost pulled off an unlikely comeback. Donegal opened up an eight point lead that they held for most of the game and a late Gaels comeback saw it reduced to two points, but it proved to be a bridge too far for the Gaels and the northerners held on to retain their hundred percent record. Eric Monahan takes on Mark Canning. The second half continued in the same vein as the first with Donegal too full of running for the Gaels. The northerners tallied four points to one for the Gaels in the 10 minutes following the restart. White and Maguire were the proponents. Eric Monahan accounted for the solitary Gaels point, but a goal from center forward Sean Moran heralded a Gaels comeback. The Gaels broke downfield and Moran blasted the ball goalwards and it found the back of the net. Dara McCormack, Daryl Hayden, and Sean Curran were brought into the fray as the Gaels brought in some fresh legs. Hayden pointed, and shortly afterwards almost netted but Peter Boyle saved well. The Gaels then enjoyed a spell on top and pointed four times without reply to reduce the gap to five points. McCormack played a big part in the revival, the big man proved to be an effective target and played the ball well into the forward line. A penalty then came, and Monahan delivered with a low shot and now the Donegal lead was a mere two points with plenty of left to play. The Gaels did themselves no favours in the final minutes and Donegal took full advantage of some sloppy passing to restore the lead to four before the final whistle. A gallant display from the Gaels and for Donegal another win in the bag. The senior hurling championship got underway with Fr. Tom’s and Wexford facing off on a cool sunny Sunday afternoon. Wexford had the edge over their opponents in almost all facets of the game, but especially on the scoring end as several Wexford players contributed to the scoresheet while Tom’s had to rely on the stick of David O’Mahoney for almost all of their scores. Wexford held a slight advantage at the end of the first half with a four point lead. Tom Maloney opened the scoring for the Slaneysiders and Kevin Sheerin added a second before Tom’s got on the scoreboard. Keogh and Sheerin added two more and Tom’s struck back with a goal from Shane Howley. Howley booted the ball across the line from close range. Tom’s took a brief lead when O’Mahoney pointed from a free, but then Wexford kicked it up a gear and took over the latter part of the first half. Eoghan Kavanagh canceled out Tom’s goal with a three pointer from inside the 21. Wexford then added points from Sheerin and Kavanagh as the scoring was spread around the forward line. Tom’s were reliant on the prowess of O’Mahoney at corner forward for their scores, as apart from Howley’s goal all the scores came from the number 12. At the break Wexford led by four points, 1-10 to 1-6. Things did not improve for Tom’s in the second period. Wexford maintained the upper hand and chances were few and far between for the boys of the west. A free that was moved up 10 yards into a more scoreable position even went amiss for Tom’s as their luck didn’t change. Wexford widened the gap as the half wore on, Michael Maloney got in on the act with a point following a mis-hit clearance. With the time running out, hope faded for a turnaround for Tom’s and Wexford kept up the pressure. A late consolation goal from Ciaran Moore improved the look of the scoreboard, but Tom’s will be hoping for better things to come as the championship moves on. 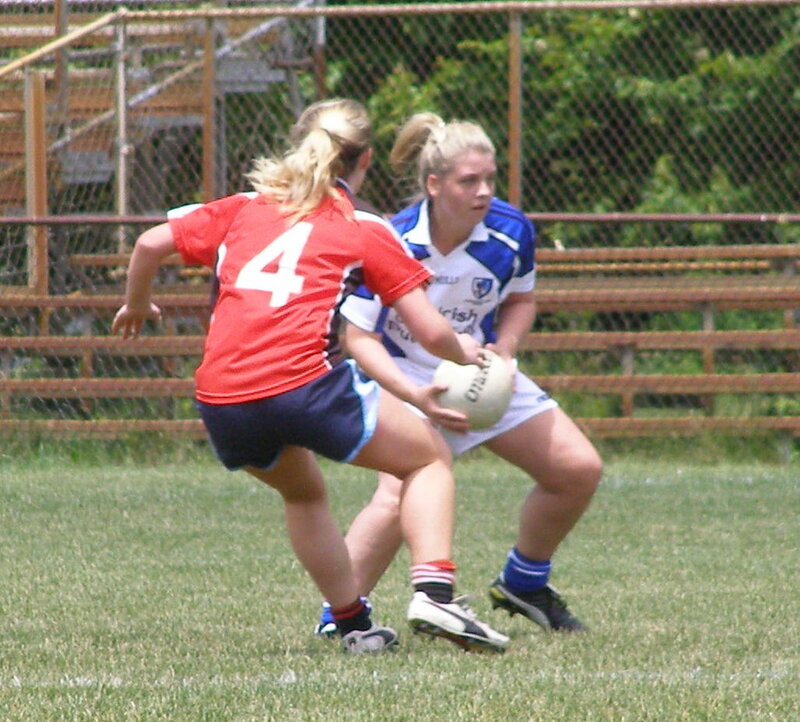 game of the Ladies Senior Football Championship. The second half began with a run from center back Eileen McElroy deep into Tir na nOg territory. The final shot was wide, but it was clear what the intention was. Tir na nOg had to satisfy themselves by feeding off Caroline Nee free kicks, which were far too rare from the point of view of the Brighton side. The westerners swept down the field almost at will, and a score looked likely with each attack. Brett and Ryan added another two goals each in the second period as well as a raft of points. The best score of the day for Tir na nOg came from the boot of full forward, Healy, who finished off a fine move for a goal, but it was more a case of playing for respectability by that stage for Tir na nOg. The new kids are in town, watch out! Donegal and the Blues lead the way in the early going, each team with 100% record. Kerry are also flying high with 5 points from a possible 6. The Gaels and Tones are also also sporting unbeaten records. Galway, Christopher's and Aidan McAnespies have each lost a game, but are very much in the playoff hunt, while Cork Mayo and Armagh-Notre Dame will be hoping to turn things around and take points of teams above them. Pope John Paul Park, Dorchester Ma. The junior senator from Massachusetts, Scott Brown, made an appearance at the Irish Cultural Center as the defending Junior A football champion Wolfe Tones took the field on Sunday and faced Donegal in a repeat of last year’s final. It was a keenly contested game, and in spite of losing Mick Sammon to a red card in the second half, the Tones maintained their superiority to take the spoils. 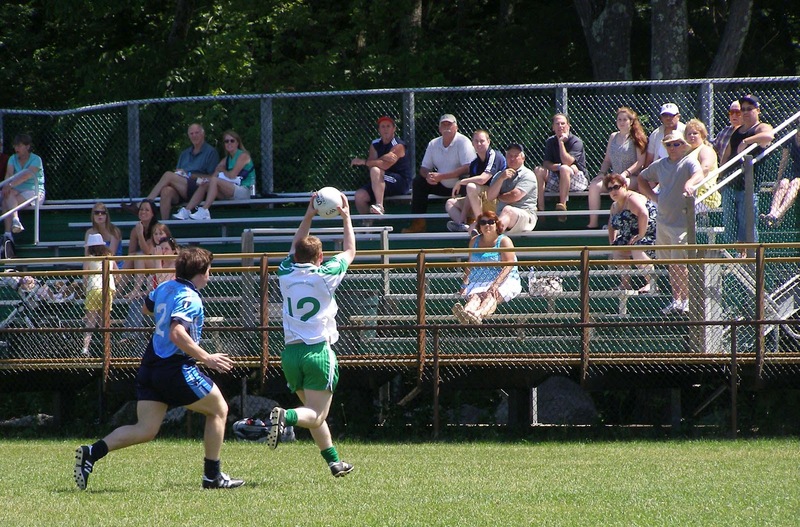 to the ins and outs of Gaelic Football before the game. Though Donegal enjoyed an advantage on the scoreboard early on, neither side was able to impose themselves on the game. Michael McGinty opened the scoring with a well taken point, and was followed by Kevin Curran and Brian Farrelly. Play flowed back and forth as each back line mopped up, but neither forward line could breach their opposing defenders. The Tones got themselves back into it on the scoreboard towards the end of the half as the points eventually began to flow. Mick Sammon, Mike O’Brien, and two more Sammon frees brought the champions on level terms at the half, 0-4 to 0-4. Donegal's Michael McGinty bursts past the tackle. The Tones took the bull by the horns in the second half. The middle of the field belonged to Thomas Murphy and Gavin Walsh as the champions enjoyed most of the possession and played the ball around nicely. Christy Bell opened the scoring for Donegal but Sammon answered with two well taken points from play. Sammon added two more points from frees, and then the Tones struck with a goal. Darren Lowry fielded the ball well in the corner and combined with Fergal Conway who found Murphy on the 14 and the number 9 blasted home to give the Tones a five point lead. Donegal quickly got the goal back thanks to some some industrious work from Bell who finished low from close range. Donegal had an opening to turn the game around after Mick Sammon was shown the red card for his reaction to a foul by his marker, Darren Doherty. Doherty was given a yellow for the foul. The Tones, as they did in the senior match beforehand, dug deep. Gavin Walsh stepped up in midfield and Shane O’Brien put in a hard fought effort aftercoming on to the field of play. Another goal came, and again it was Thomas Murphy who was the finisher to restore the Tones lead as the champions held on to win the two points on offer. Referee: Jimmy Trimble who did an excellent job refereeing the game. Donegal: J. Byrne, P. McNulty, D. Doherty, N. McLaughlin, E. Doonan, P. McLaughlin, M. McGinty, C. Bell, E. McCarney, K. Curran, B. Friel, B. Farrelly, N. McConnell. Tones: B. Murray, A. Rooney, K. Gill, M. O’Brien, K. O’Regan, C. Malone, G. Walsh, D. Lowry, T. Murphy, G. Molloy, F. Conway, M. Sammon, G. Leonard. Galway and McAnespies shared the spoils in a game that huffed and puffed and never really came to life. For a time it looked as if McAnespies would finally take advantage of the extra man following the sending off of Sean Gallagher, but there was a twist in the tale and Galway snatched a late equalizing goal from Peter Nolan at the death. Sean Cournane was in good form for McAnespies. Galway opened the game brightly and put over three unanswered points to get affairs underway. Ollie Doherty scored after the first sequence in play, and points also came from Jamie Kehoe and Doherty free. The Galway forwards looked quick and played the ball around nicely. McAnespies began to show a little more as the half wore on. Sean Cournane pointed a free and Niall Gallen added another from wing back. A Cournane free leveled the scores, and Cournane then followed with a lovely point from play as he weaved his way on the endline and finished with the left boot. Mid way through the half Sean Gallagher was shown the line by referee Tadhg Lucey for striking an opponent, and Galway looked like they had it all to do. McAnespies played the extra man in the back line, and Galway still enjoyed plenty of possession. After Gareth O’Neill put McAnespies two to the good Galway showed patience on the ball to wait for the right scoring opportunities. Danny Reddin, Doherty, and Graham Cullen put four over the bar between them to make it a two point half time advantage for Galway, 0-7 to 0-5. Paul McConway tries to rally McAnespies. McAnespies quickly got themselves back ahead with a goal from Cournane in a flash of the type of football we saw from the champions a short year ago. Colm McCrory played a great handpass to the inrushing Cournane, and the Caherciveen man blasted home low and hard. McCrory followed up with a point and Macs led by two. Galway pulled level thanks to two Doherty pointed frees with 15 minutes left. Macs then seemed to turning the screw as Galway began to tire. It was the effort of individuals that led McAnespies back, Colm McCrory in particular and Fergal O’Doherty making forward runs in efforts to claim both points. The champions, however, missed some easy scoring chances that would bite them in the end. Cournane put McAnespies ahead with a great score, and followed with a second as time was winding down. Colm McCrory appeared to have put the game away for McAnespies with another point, but thanks to Galway’s quickness and endeavor in the forward line an opening was created for substitute Peter Nolan who slotted home from close range at the final whistle. Disappointment for McAnespies, and for Galway a point salvaged that will do their confidence no end of good. Macs: P. Coakley, P. McConway, M. Bogue, C. Dempsey, F. O’Doherty, N. Gallen, G. O’Neill, M. O’Ganaill, G. McAlinden, N. McCrory, S. Lynn, S. Cournane, C. McCrory. Galway: P. McComiskey, S. Fox, J. O’Callaghan, S. Gallagher, E. Whelan, R. Vickers, O. Doherty, E. Kavanagh, J. Kehoe, L. Kelly, D. Reddin, G. Cullen, M. Kenny. A warm sunny afternoon greeted the footballers of the Connemara Gaels and Wolfe Tones amid the sounds and smells of the Irish Festival at the grounds of the Cultural Center in Canton. The game ended in a draw, but it is likely that neither side was pleased with the result and probably more so the Gaels as it really was a blown opportunity to knock off one of the early favourites. The Tones were favoured coming into the game, but Gaels played most of it with a man advantage and held on to a one point lead into injury time, with the equalizing score coming from Gary Brilly with virtually the final kick. 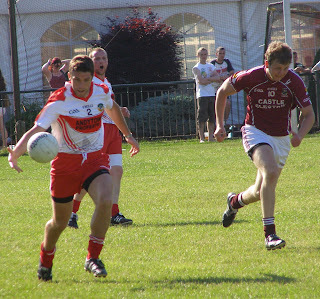 The Gaels Eric Monahan is pursued by Pauric McGuirk. The Tones were first out of the gates with two points and wearing the tag of favourites, it seemed inevitable that the South Boston side would continue to press in the early stages. The Gaels answered with two points to even things up, but then a two-goal salvo came from the Tones. Collie Carr netted a fortunate first, James O’Donnell in goal for the Gaels should have done better to field what appeared to be a fairly routine catch, but somehow lost the ball and it ended up in the back of the net. Corner forward Barry Grogan followed up shortly afterwards with another from close range and the Gaels were reeling. 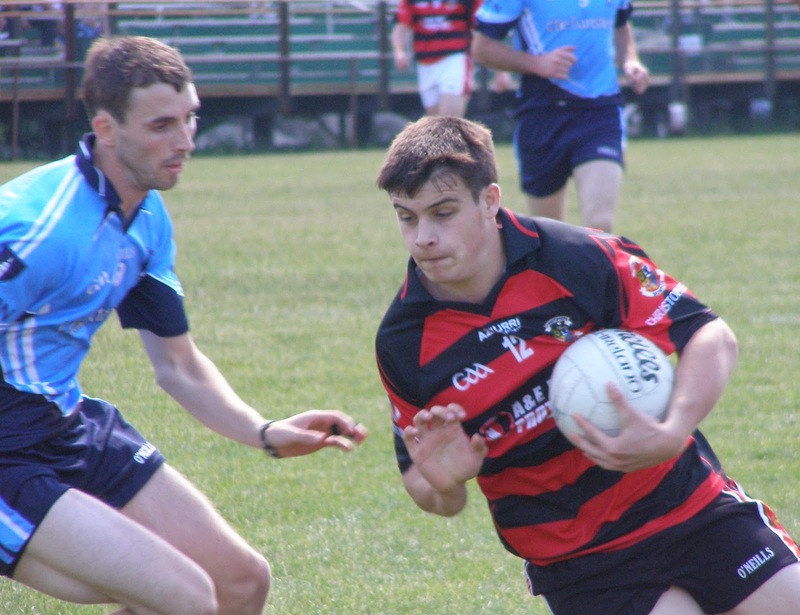 The Connemara men kept working at it; Sean Conneely was a leading factor in the back line and Brian Joyce worked hard in the middle of the field. After a point from a Noel Graham dead ball, the Gaels answered with two goals of their own. Both came from corner forward Eric Monahan. Sean Conneeley cut out a forward ball by the Tones to set up the move for the first goal for the Caherlistrane man. The second came shortly after Collie Carr saw red following an off the ball incident. At the break it was the Gaels by a point, 2-3 to 2-2. Gary Brilly dispossesses Noel Graham. Starting the second half off a man to the good, the Gaels built their lead by adding two points through frees from Monahan. The tide then turned in favour of the Tones. The Gaels short kickouts were not working and persistent fouls in front of their own goal led to some easy frees for the Tones, who were making a tremendous effort to create the space and make up for the deficiency in personnel. Barry Grogan took two points from frees and followed them with two tremendous points from play to put the Tones into a surprising three point lead. The Gaels re-gathered their concentration and pulled back two points through Monahan and substitute, Dara McCormack. After a badly missed free from Marty Farrell at one end, the Gaels swept upfield for Padraig Cunningham to level the scores with a well taken effort from range. The Tones again threatened to take the lead, but again a poorly taken shot was gathered by the Gaels. 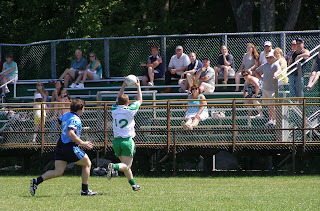 Graham carried upfield and eventually the ball found wing back Fiacra O’Beara who put a great effort between the posts. The Gaels tried to kill off the game by keeping posession, but the Tones had one final effort to get a result from the game and Gary Brilly leveled the scores with a point to make it all square. Gaels: J. O’Donnell, D. Doolan, C. O’Donnell, S. Conneely, J. Vaughan, F. O’Beara, B. Joyce, G. Delaney, C. Mulkerrins, N. Graham, P. Cunningham, E. Monahan, D. Hayden. Tones: R. McKeown, P. McGuirk, C. Lynch, G. Brilly, B. Kinahan, D. McGuire, C. McCarthy, J. Farrell, C. Carr, C. Joyce-Power, M. Farrell, B. Grogan, M. Newman.